A Healthy Beautiful Lawn is One Step Away! Use our Online Estimate. Get an accurate estimate immediately and take advantage of our current offers instantly. You can start your Greenfeet Service Today! We are celebrating 14 years of providing organic-based lawncare to the North Atlanta Area. We have always provided our customers with a safer alternative to traditional chemical lawncare. Proving you can have a rich, lush lawn your children and pets can play on without concern. That’s the beauty and simplicity of Greenfeet Lawncare, where we have always been Green before Green was Cool. Spring Aeration SAVE 10% Call Today! Get a discount on your next lawn care service when you refer a friend who signs up! 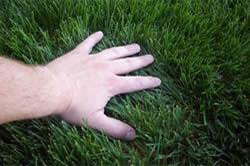 Our lawn specialist will tailor your program to the exact needs of your lawn. Sometimes that may mean an extra feeding or soil conditioning application. In other words, whatever your lawn needs is what we give it, in the right amount, at the right time. Here at GreenFeet Lawncare, we pride ourselves as lawn care experts. So we feel it is important to share our expertise with our customers. Click Find Out More and Download our Free Tip Sheet. I started my service last fall.I love that they use chemicals that I feel comfortable with on my lawn. Yard looks fantastic and safer for my children and pets. Greenfeet Lawncare is the Best! We are grateful for very friendly and courteous service, and for a marked improvement in our lawn; despite the recent weather conditions!